Parties - Mr. Fussy is all alone at Mr. Messy's party; Mr. Nervous delivers pizza to a fancy dress party; Mr. Bump plays painful party games at Little Miss Whoops' get-together. Up and Down - Mr. Grumpy is annoyed by people sitting above him at a game of Dillyball; Little Miss Magic tries to help Mr. Rude in a restaurant kitchen; Mr. Noisy tries to sell Little Miss Scary a vacuum cleaner. Dining Out - Mr. Fussy fights to keep down his food at Little Miss Magic's cafe; Mr. Grumpy has trouble ordering at Mr. Tickle's restaurant; Little Miss Naughty plays tricks on her customers. Gifts - Gifts for Mr. Fussy and Mr. Messy get mixed up; Mr. Tickle tires to help Mr. Rude make sales at his shop; Mr. Nervous is afraid to open a present from Little Miss Scary. Sun and Moon - Mr. Scatterbrain's late night gardening wakes Mr. Grumpy; Little Miss Daredevil and a team of astronauts collect moon rocks; Mr. Nervous fears the sun on a trip to the beach with Miss Chatterbox and Mr. Rude. Telephone - Mr. Rude talks on the phone during Mr. Fussy's concert; Mr. Bump and Mr. Tickle fix a telephone line; Little Miss Helpful thinks a new phone will make Mr. Grumpy more popular. 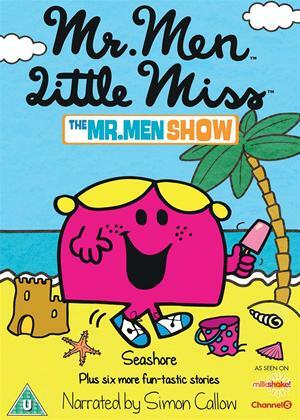 Seashore - Mr. Quiet battles birds at the beach; Mr. Stubborn gets himself and Little Miss Chatterbox in deep water; Little Miss Scary warns seashell searchers about sea monsters.